The Balmoral origin -Did you know Balmoral Mill Shop and Coffee Shop started life as the Browns Institute? Browns Institute in Polwarth Street was built with money gifted by Miss Martha Brown of Lanfine Estate in 1864. Her father, Thomas was a surgeon and banker in Glasgow. He lectured at Glasgow University and was Professor of Botany. He married Marion Jeffrey and they had four children, Martha, Thomas, Harriet and Marion. Lanfine House was built for John Brown (1729-1802) a successful textile manufacturer and banker. He was also a Baillie in the city of Glasgow and became wealthy enough to buy Waterhaughs, the property of his maternal grandfather. He acquired 400 acres at Lanfine presumably when Cessnock Estate was sold by the Hume family in 1769 and immediately set about the construction of the mansion House. The building work was undertaken by James Armour of Mauchline, who was to become the father-in-law of Robert Burns. Lanfine House was completed in 1772. On the death of John Brown in 1802, his son Nicol Brown took over as Laird of Lanfine and Waterhaughs. About 1811, he planted Lanfine Woods. After the death of Nicol Brown in 1829, the estate was inherited by his cousin Thomas Brown. The three Miss Browns lived there from then on until their deaths. This then was the background to the money that was spent in all three Valley towns to found an Institute. The latter half of the 1800s was a time when institutes for working men were springing up all over the country. Their aim was to provide facilities for education and recreation at little or no cost. The men could go there and play cards or pool or chess or darts for instance. There was also a supply of Daily Newspapers and there were classes in reading, writing, arithmetic as well as wood working and leather work such as putting new soles on to pit boots. Occasionally there were lectures perhaps in politics but also in growing vegetables, raising poultry and stories of other countries. Two music societies also met in an evening, one was for voices, The Galston Choral Society led by Mr David Auld and one for musical instruments, mainly brass which later became the Galston Burgh Band. It was also hoped that by providing these classes and entertainments it would keep the men from the public houses where they would often drink away the bulk of their wages. The upstairs part of the building consisted mainly of one room big enough in which to hold functions. Local clubs used this hall for annual dinners and concerts. Wedding receptions were also known to be held there and visiting ministers and lecturers used the hall to attract a greater audience. 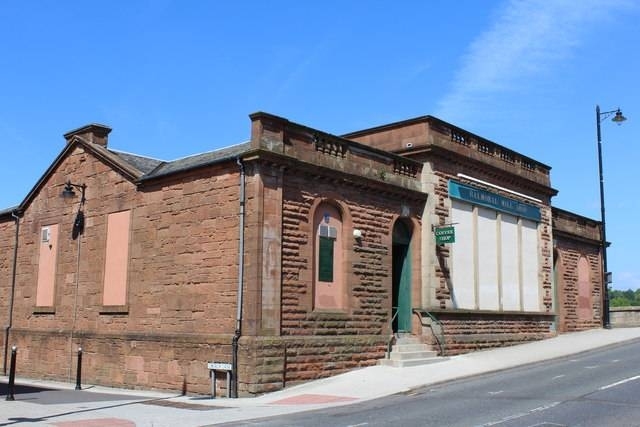 There are articles in the Irvine Valley News or the Galston Advertiser and Weekly Supplement, held in the Burns Monument Centre, which tell of some of these occasions. 28 Oct 1892:-A Conversazione was held in Reading Room of Brown’s Institute by Galston Bowling Club. A very good night was had by the bigger than normal attendees. The ladies of the Club supplied a meal that was enjoyed by all. In his speech the President made passing remark on the setting up of a Scottish body to oversee the rules and regulations of the game. Everyone was agreed that this could only be a good thing. 20 January 1899:- The Lawn Tennis Ball was held in the Brown’s Institute. The music was by Messrs Inglis of Newmilns, Miss Steel of the Portland Arms catered and the event was organised by Mr Richmond, cabinet maker. There were between 30 and 40 couples in attendance. However working practices were slowly changing through the advances of the Unions. The six day week was introduced and then became even shorter and shifts had a more regular structure. The men had more leisure time to enjoy such activities. Wages were also improving and so many families bought their own newspaper. The men who mainly used the Institute were mostly miners, but not all, and with the demise of the pits in the 1950s the need for the Institute ceased and it became vacant. It lay empty for many years but was taken over by Balmoral Knitwear in 1987. At first it was used for storage and then the shop inside Balmoral Mill was closed and a small shopping area opened in the Browns Institute building. Over the years this area has been enlarged and altered until it became as it is today, a coffee shop and shop for selling the products of the factory and from other sources. Article courtesy of Irene Hopkins Galston Community Development Trust.